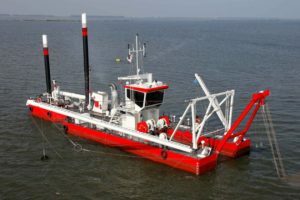 The Dutch dredger Royal IHC signed a memorandum of understanding with the Indonesian shipping company PT Humpuss‎ on cooperation in the field of dredging projects in Indonesia. PT Humpuss‎ intends to expand its shipping business, for which it will be necessary, with the help of the specialized fleet of IHC, to bring the depths along the shipping waterways of the country to provide safe navigation. The decision for cooperation between the both companies was taken by the management of the Indonesian shipping company, after the participation of President of PT Humpuss‎ at the IHC Dredging Workshop in Jakarta in April 2017. However, finance details or framework of the agreement were no released. Royal IHC (part of the IHC Merwede Foundation group) is the largest international company specializing in the design and manufacture of innovative dredging vessels and auxiliary dredging equipment, stone-laying vessels, various equipment for port administrations, oil and gas corporations, major mining companies, offshore shelf contractors and State companies. The head office of Royal IHC is located in the Netherlands. The company has more than 3,000 employees and hasf representative offices and production centers in the Netherlands, Brazil, China, Croatia, France, India, Malaysia, the Middle East, Nigeria, Singapore, Slovakia, South Africa, the United Kingdom and the United States.